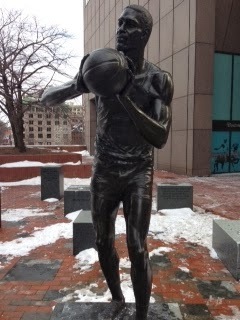 An example of leadership: Bill Russell Monument, more than a basketball player. "Celtics legend Bill Russell attended a star-studded unveiling of a statue of himself on City Hall Plaza today. The unveiling of the 6-foot-10, 600-pound statue, held under a tent, was attended by, among others, Boston Mayor Thomas Menino, Celtics owner Steven Pagliuca, and outgoing NBA Commissioner David Stern. Outside the tent, in the wind and rain, a crowd of about 200 gathered, chanting, “Thank you, Bill Russell. Thanks for all the championships.” Russell looked at the crowd, gave them a broad smile and a quick wave. He then was spirited away in a golf cart to a reception at a nearby downtown office building. A public ceremony had been scheduled, but it was scaled back due to inclement weather, officials said. Those in the room for the reception included former Celtics players Sam Jones, Jojo White, Satch Sanders, and Bill Walton. Other former players included Charles Barkley and Bill Lanier. Those attending said that Russell contributed not just on the basketball court, but by his support for civil rights and education for children. Russell, 75, who looked trim, wearing a gray suit coat and pants, with a blue shirt, became emotional when he said all he ever wanted to do was to make his father proud and live each day that way." 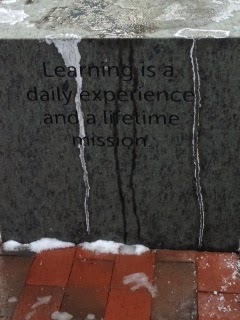 As the author of "Boston Bronze and Stone Speak To Us", I feel this monument speaks not just about physical strength of any successful athlete, but also about an athlete 's spiritual strengths and values that lead him or her to their goals. Bill Russell was not just another basketball athlete for kids like me but also a team leader. A unique shining star of our Boston Afro-American community, a strong role model for both men like Gov. Deval Patrick and myself. 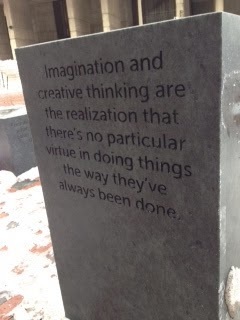 "Boston Bronze and Stone Speak To Us" can be purchased on Amazon.com, Barnes & Noble Bookstores, Old North Church Gift Shop, Bestsellers Cafe Bookstore etc.